Will you allow me through your columns to appeal to the countless admirers of one of England's greatest teachers and of the world's most perfect artists? That portion of 'Leafy Warwickshire' in the midst of which little Marian Evans drew her first inspiration, literally beneath some of the very oaks which formed part of the classic Forest of Arden, has of late years proved to be a teeming storehouse of mineral wealth, and a large and vastly increasing industrial population at the present moment is solely dependent for its supply of public literature upon a few mouldy books, shockingly housed in a small tenement somewhat approximating to a three-and sixpenny cottage. Almost every yard of Milby (Nuneaton), Shepperton (Chilvers Coton), Paddiford (Stockingford), Cheverel Chaise [sic] (Arbury) is classic ground for the scores of English and American pilgrims who annually visit the neighbourhood to view the novelist's birthplace (South Farm), the Red Lion (Bull Hotel) ... and those other interesting spots referred to in the writer's earliest success, 'Scenes of Clerical Life' .... A really fitting memorial is proposed in the shape of a much needed public library to correspond, in a humbler fashion, with the Memorial Theatre ... [at] Stratford on Avon. This scheme has been heartily adopted by the newly elected Urban Council ... and alternative plans for a suitable building are under consideration. 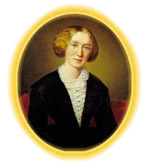 The piece went on to appeal for funds from George Eliot's admirers to be sent to the Clerk to the Council and to Mr. A. F. Cross, editor of the Nuneaton Observer and, thirty-four years later, the founder of the George Eliot Fellowship.